Laughter lines are no laughing matter! We have our very own aesthetic nurse who is trained to administer dermal fillers, and can offer both anti-wrinkle treatments and lip fillers. Our anti-wrinkle treatments are aimed at the nasal folds, or laughter lines, the creases that lead off from the bottom of each side of your nose diagonally down to the corners of your lips. For some, these lines can be very deep and deemed unpleasant. With a simple anti-wrinkle procedure, lines can be removed. 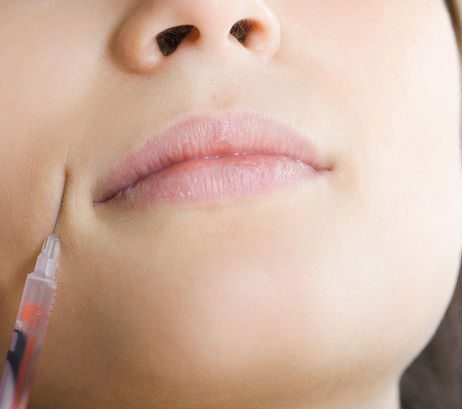 Even after a single injection, lines will appear less visible. Nasal fold anti-wrinkle treatments are commonly procedures for a slightly older clientele due to the fact that laughter lines appear over time, and aren’t nescessarily a problem for younger people. We use the popular and proven Uma Jeunesse filler for all our anti-wrinkle and dermal lip filler treatments. One session of anti-wrinkle treatment is £180, or £165 each when you book with a friend. Other anti-wrinkle treatments we offer include the popular NYTOX treatment, or vampire facial as it has become known. More of a rejuvenation treatment, a blood sample is take from the client’s arm, the good bits (the plasma) are extacted using a centrifuge manchine and then put back into the skin using a dermal roller. The little needles on the roller traumatise the skin, allowing the good, natural ingredients of the plasma to reenter the body by seeping into the tiny holes. The result is more youthful looking skin. If you are interested in any of our aesthetic treatments, please contact us on 0161 839 6112 to speak to our aesthetic nurse Holly.